Dhaka, 24 April, Abnews: Canadian police are questioning the suspected driver of a rented van that ploughed into pedestrians in northern Toronto on Monday, killing 10 and injuring 15. Alek Minassian, 25, was not previously known to authorities, police said. The incident appeared to be deliberate but the motive was not clear, officials added. Canadian Prime Minister Justin Trudeau said the "tragic and senseless attack" had brought him "great sadness". Meanwhile, an officer has been praised for not opening fire during a tense standoff with the suspect, who claimed to be armed. Video broadcast on CBC News showed a man pointing what appeared to be a gun at officers and shouting "kill me". The officer tells the man to "get down" and when the suspect says he has a gun, the officer repeats: "I don't care. Get down." The suspect was then arrested without shots being fired. Minassian is due to appear in court at 10:00 local time (14:00 GMT) on Tuesday. 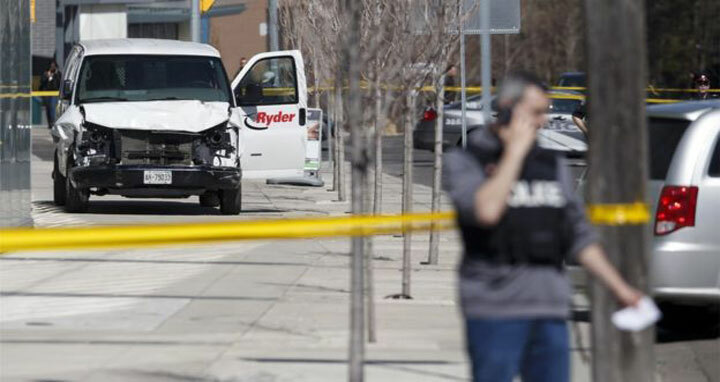 Police said the white rental van mounted the kerb on Yonge Street between Finch Avenue and Sheppard Avenue at about 13:30 local time (17:30 GMT) on Monday and drove into pedestrians along a 2km (1.24-mile) stretch. Reza Hashemi, who owns a video shop on Yonge Street, told the BBC he heard screaming on the other side of the road. He said the van was repeatedly mounting the pavement and running into people. One witness told City News that the driver was "hitting anything that comes in the way". "People, fire hydrants, there's mail boxes being run over," said the unnamed man, who said he was driving behind the van during the incident. As the van continued, the man said he sounded his horn to try to warn pedestrians. "I witnessed at least six, seven people being hit and flying in the air, like killed, on the street," he said. Pictures from the scene showed bodies covered in orange sheets along the van's route. Debris and items of clothing were scattered across the pavements and road. The van was brought to a halt by police several streets away and was quickly surrounded. The suspect was arrested 26 minutes after the first emergency call was made to the police. Police said Minassian was from the northern Toronto suburb of Richmond Hill and was not previously known to authorities. "The actions definitely looked deliberate," said Toronto Police Chief Mark Saunders. Public safety minister Ralph Goodale said there "would appear to be no national security connections" and Canadian broadcaster CBC cited government officials as saying he was not associated with any known terror groups. Minassian had previously attended a school for students with special needs in north Toronto, former classmates said. But she said Minassian had not been violent. "He wasn't a social person, but from what I remember he was absolutely harmless," she told Reuters. Another former student, Ari Bluff, told CBC that Minassian did not seem to have many friends. "I remember seeing him probably just walking down the halls, usually by himself, or in the cafeteria by himself," he said. Minassian went on to attend Seneca College in the North York area of Toronto, where the van incident took place, CBC reported. Reporter James Moore, with Newtalk 1010, told the BBC he had heard reports that Minassian was regarded as being "quite brilliant". Canada's Globe and Mail quotes a fellow student as saying Minassian was good at working with specialised computer chips used to process images. So far, the name of only one of those who died has emerged. She has been identified as Anne-Marie D'Amico, who worked for the US investment company, Invesco, CBC reports. The company's Canadian headquarters are on Yonge Street. A South Korean foreign ministry official told AFP news agency that two of its citizens were among the dead. The 15 injured remain in hospitals throughout Toronto. Van rental company Ryder System Inc confirmed that one of its vehicles was involved and said it was co-operating with authorities. The incident happened while foreign ministers of the G7 leading industrialised nations - Canada, the US, Britain, France, Germany, Italy and Japan - were holding talks in Toronto. Canadian Foreign Minister Chrystia Freeland said the G7 meetings would continue on Tuesday as planned. "The work of the ministers obviously goes on. This is a very sad day for the people of Toronto and the people of Canada," she said. City Mayor John Tory urged residents to remain calm. "This kind of tragic incident is not representative of how we live or who we are or anything to do with life in the city on a day-to-day basis," he said.